Unforgettable in any season - an oceanfront home with 1/3 acre of gardens with decks overlooking miles of beach and rocky headlands. Rooms with large spa or fireplace, private deck or sunroom to choose from. 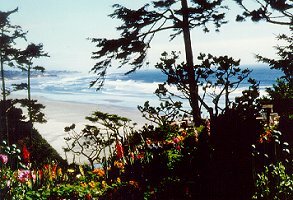 A perfect place to enjoy your vacation, anniversary, or honeymoon and experience the best the Oregon coast has to offer. This and other Newport Bed and Breakfast Inns can be found here in The Register.